Given the large number of evaluations, it is essential to have comprehensive statistics. Ingentis easy.pes offers numerous analysis capabilities. This is the only way to guarantee realistic and fair assessments of participants. In general, these analyses are not to be understood as a final result of the assessment center. Instead, they should be used as basis for further discussion, e.g. in an observer conference. 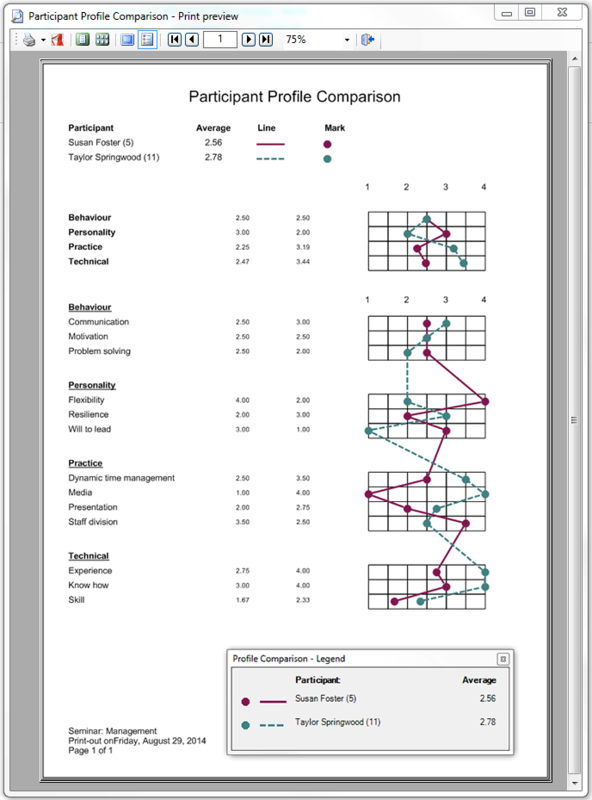 A participant profile / profile comparison displays the ratings in relation to the evaluated competences and skills for one single participant or for several selected participants as a line graph. Strengths and areas of development can be detected at a glance and then be discussed, also in comparison to other participants. Furthermore, Ingentis easy.pes offers individual design possibilities for a profile comparison with a maximum of 12 participants. The participants’ values are shown in differently colored lines. 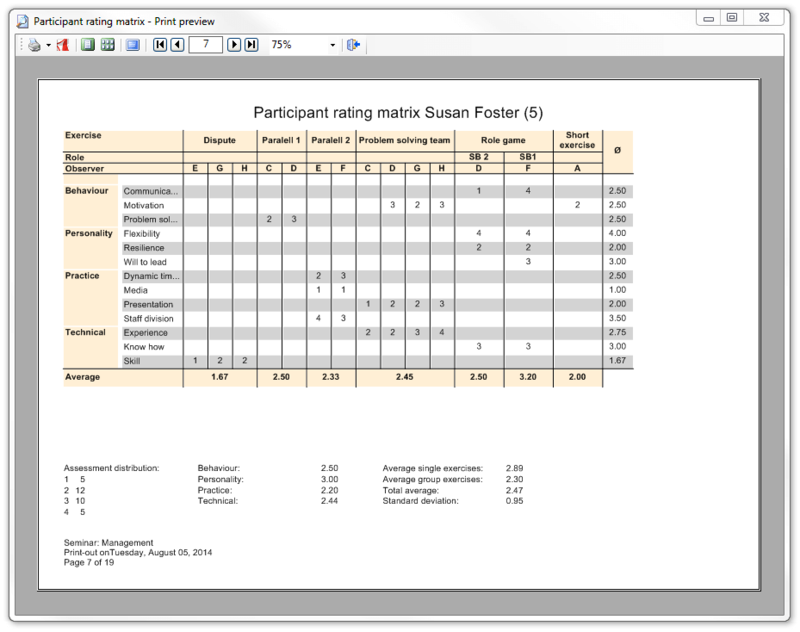 This report provides a quick comparison of all participants by listing them in a table, starting with the highest score. The report includes the highest and lowest rating, average and standard deviation as well as overall ratings for the seminar for each participant. Each page is concluded by the seminar’s overall average and standard deviation. 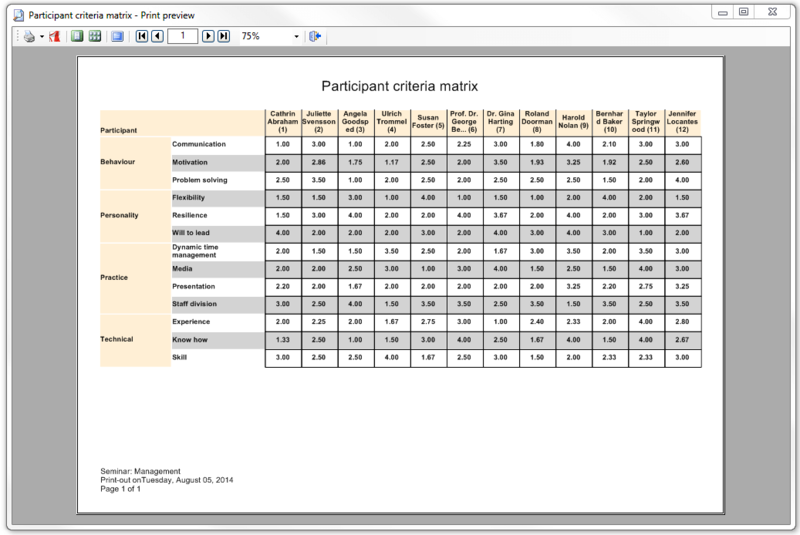 This evaluation shows all mean values per criterion per participant at a glance. The participants are sorted from left to right, based on their numerical assignment. 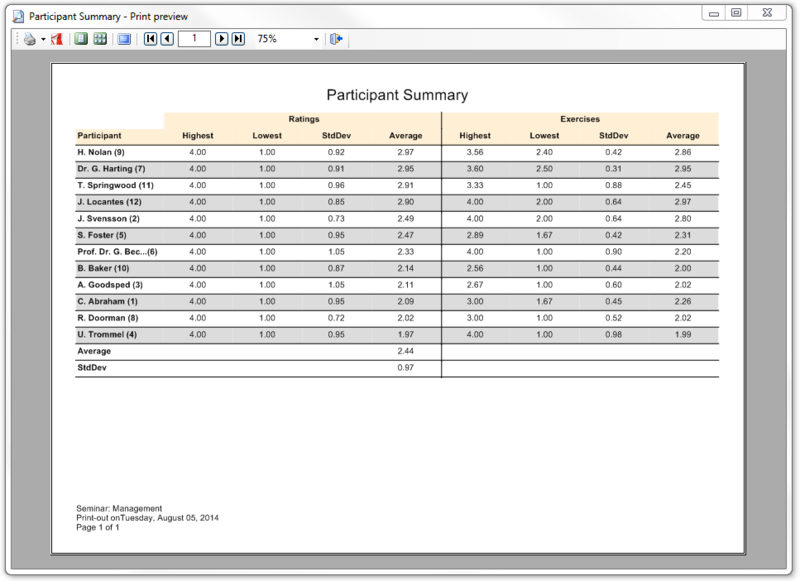 the standard deviation for the participant. A third illustration indicates average and standard deviation for this observer. 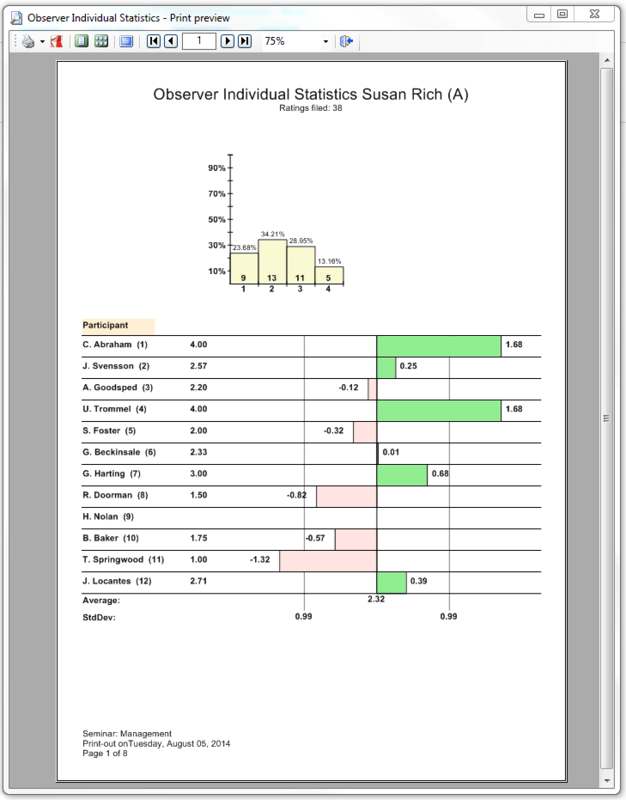 The observer summary provides a summary of the observers’ individual statistics, allowing for an overview of all of the observers’ assessments. 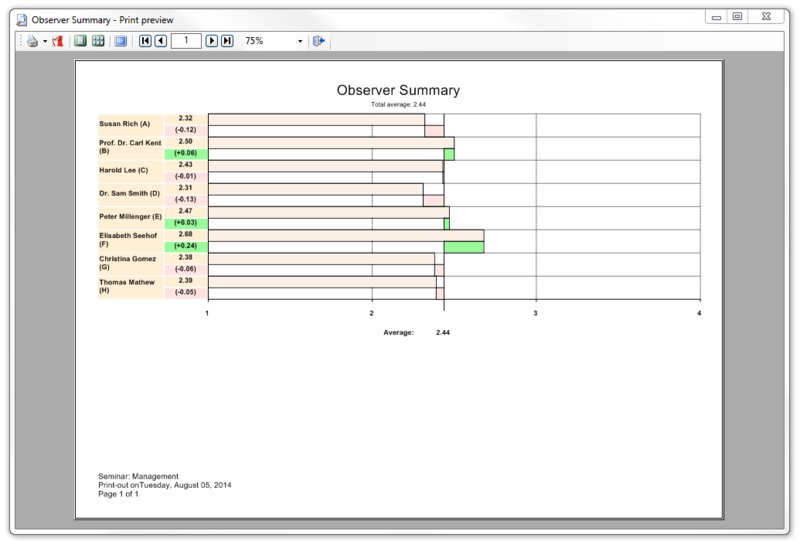 This can be used as basis to improve the observers’ performance for the next seminar. As mentioned above, Ingentis easy.pes is a customizable software product. Adding reports or changing the design of built-in reports to your liking is possible at any time. We are looking forward to hearing from you and about your ideas!